Caboose No. 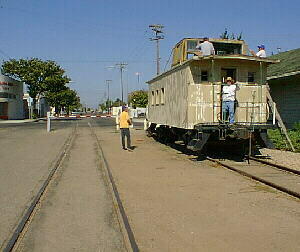 180 was purchased by the Santa Maria Valley Railroad (SMVRR) in the 1950s. It was sold to Betteravia Farms in the early 1980s. 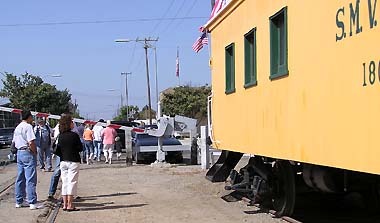 It was donated to the Santa Maria Valley Railway Historical Museum (SMVRHM) and is being restored. At right, August 11, 2001. 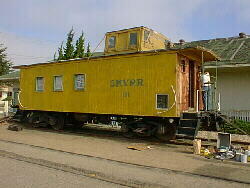 Rutland caboose, SMVRR No. 200 is at Train Mountain in Oregon. 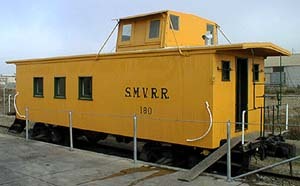 A third SMVRR caboose, No. 210, sits at the Amtrak station in Guadalupe, CA. The last car on a freight train gots its name from the Dutch term kaban huis or kabuis, literally translated as "cabin house". Before railroads, a cabin house on the deck of a ship was the designated quarters for the cook or the cook's galley. English sailors borrowed the term by the 1700s, shortening it to "caboose". The first use with railroads appeared in the mid-1800s. The floor turns crimson red. Progress on all fronts into 2002. No. 180 gets its third and final color coat. No. 180 gets its first color coat. While spackling, sanding, and cupola repairs continue, the Union oil drum gets a face lift inside. The SMVRHM accepts Caboose No. 180.